Upcycling is a way to re-use items generally thought of as waste or otherwise useless. Etsy.com has some great upcycled fashion options that I enjoy seeing. It’s nice to see some uggie sweater made into a fashionably weird shrug. Cardboard rosettes! All kinds of things. 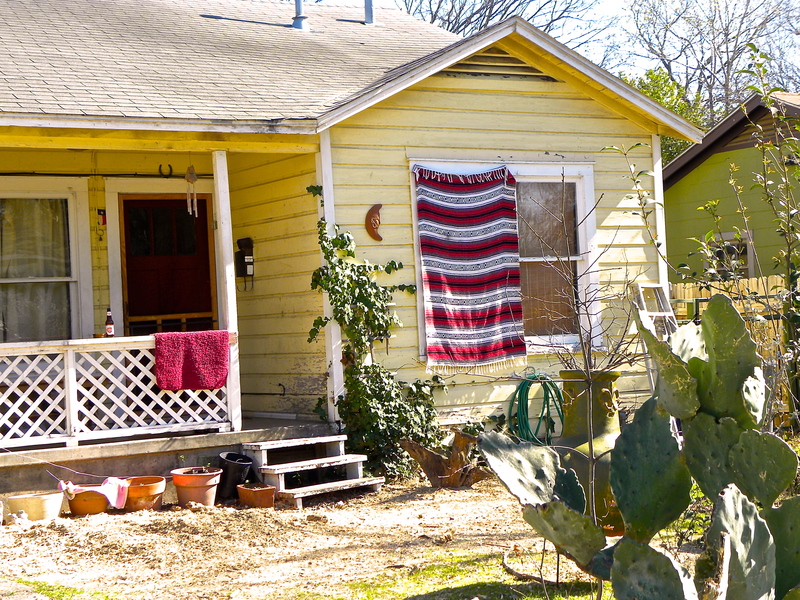 Well, here’s the outdoor upcycling I found on North Loop in Austin, Texas today. These items outshine your shiniest backyard bottle tree. 1. 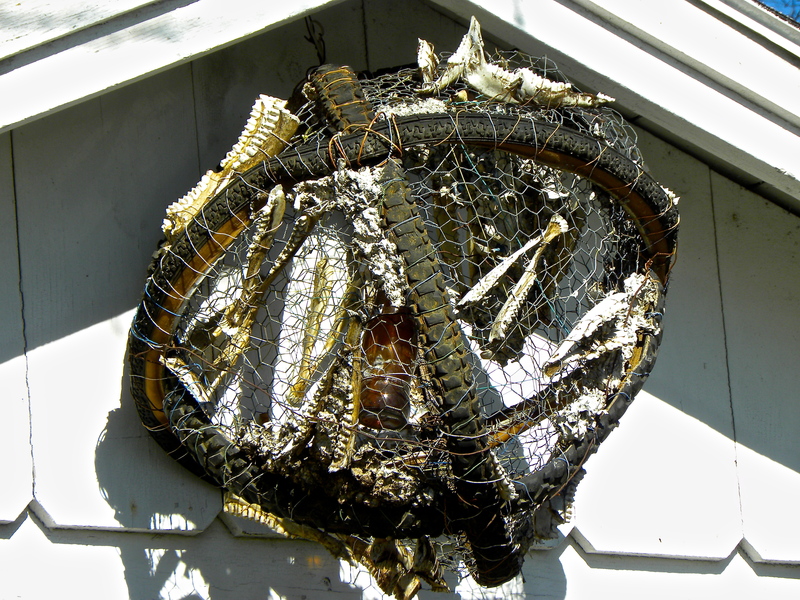 One man’s crap is another guys tangled ball of toothed jaws tangled in bike tires and chicken wire. 2. Why limit your window treatments to the indoors? Let’s think outside the proverbial box. This is a great way to re-purpose that rug or blanket that looked like hell inside the house. 4. 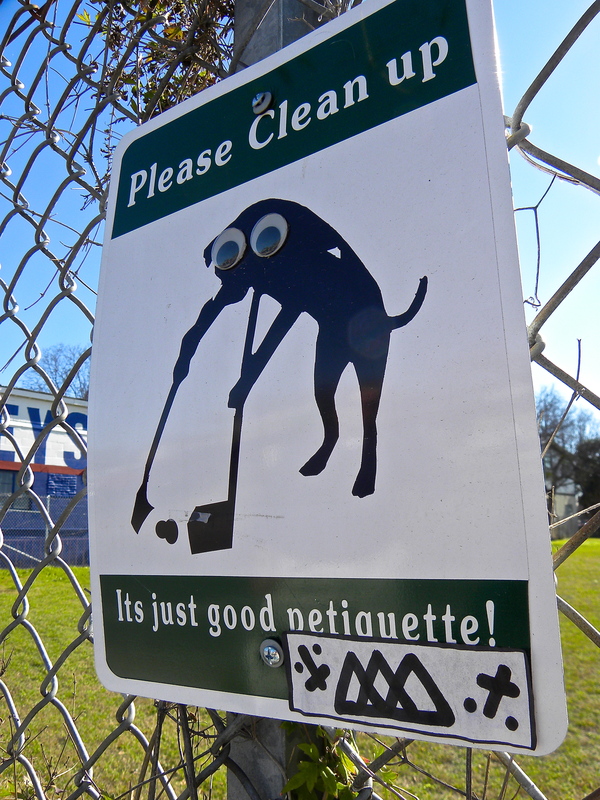 Let’s say you have some extra googly eyes. Maybe they fell off your stuffed monkey. Or you just plain bought too many one day. 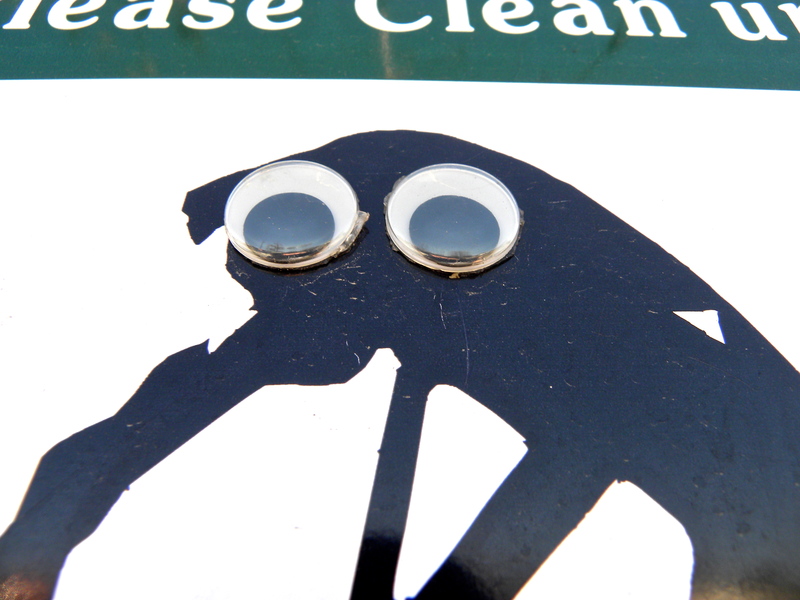 You can upcycle those eyes by gluing them to city signs to add a touch of interest to an ordinary warning. Psycho Dog cleans up after himself. 4. Used advertising posters for eyewear. Why place these beauties in the landfill after the campaign for nerd glasses ends? You can reuse those posters as decor for your drab cedar fence. Satanic symbols are optional! Posters advertising eyewear. Upcycled with Satanic elements and a furry mustache on the model. “Oh please, Jesus!” Looks like the model is about to eat that rabbit’s head right off. You know what? That vampire rabbit is ill-suited for this type of ad. 5. 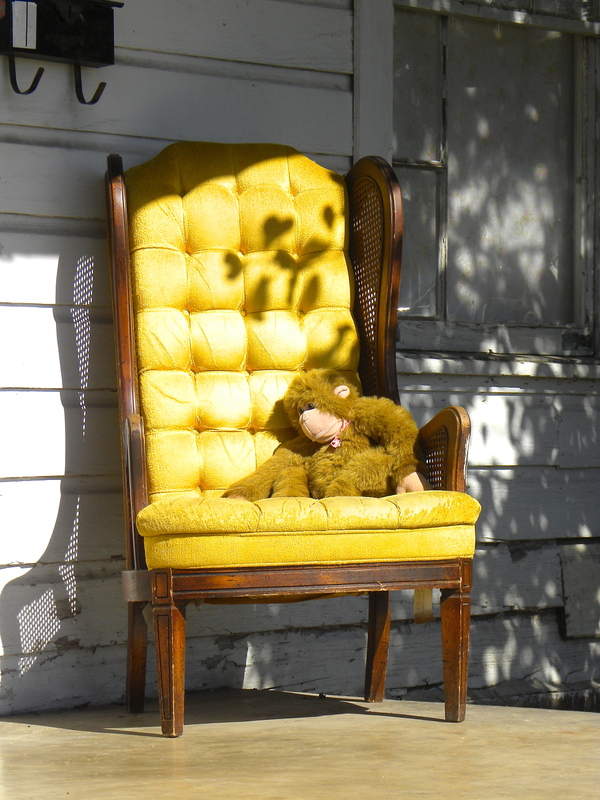 Do you have a leggy, large stuffed animal and extra Mardi Gras beads from last Tuesday? YARD ART, PEOPLE. 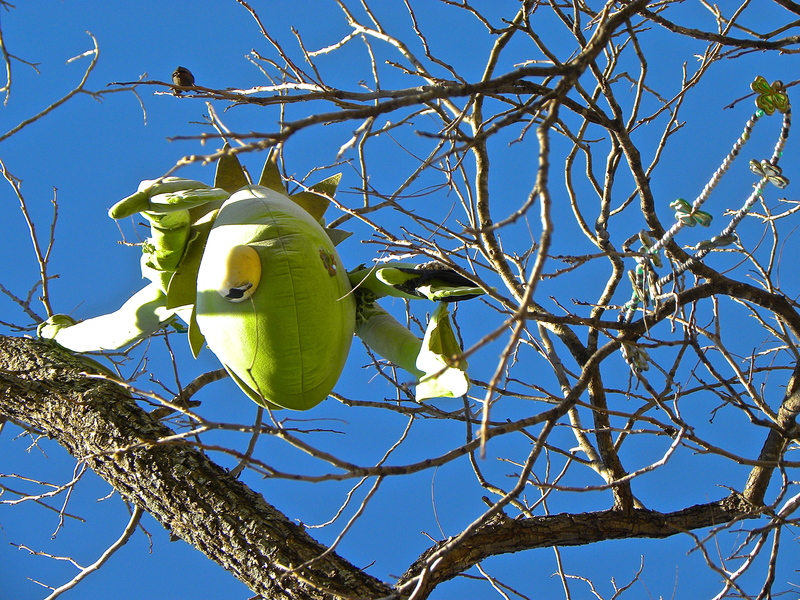 Chuck those bad boys up into a tree where they can dangle precariously for the next few years. If the objects are green, they add a nice flash of color during winter. See below. Kermit with bird and Mardi Gras beads. 6. Ugly chain link fence? Dazzle your neighbors with a bright object carefully woven into the wire. In this case, rather than throwing out the gag gift spider, the home occupant utilized it as a brilliant cover-up for a boring city fence. Charming! 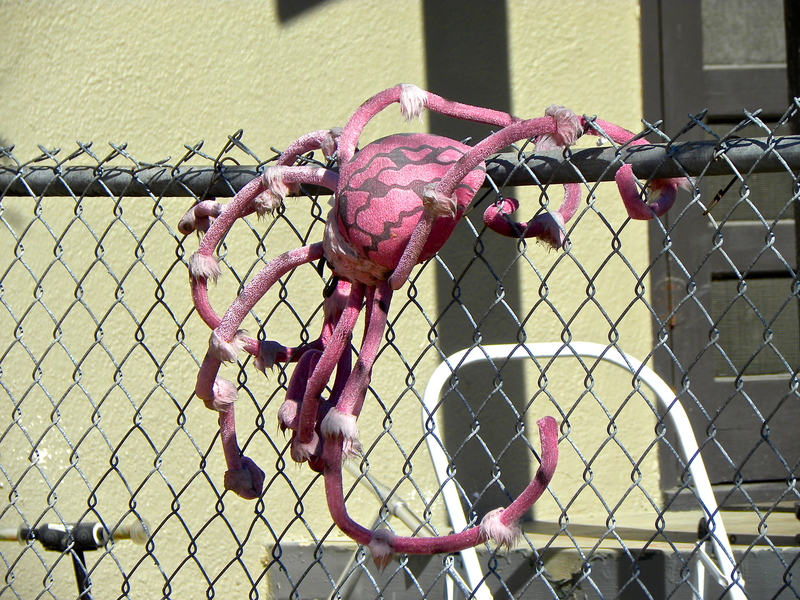 Pink spider on a fence. 7. Spare cardboard that got wet and can’t be recycled per city instructions? Make a cut out and use it as a stencil. 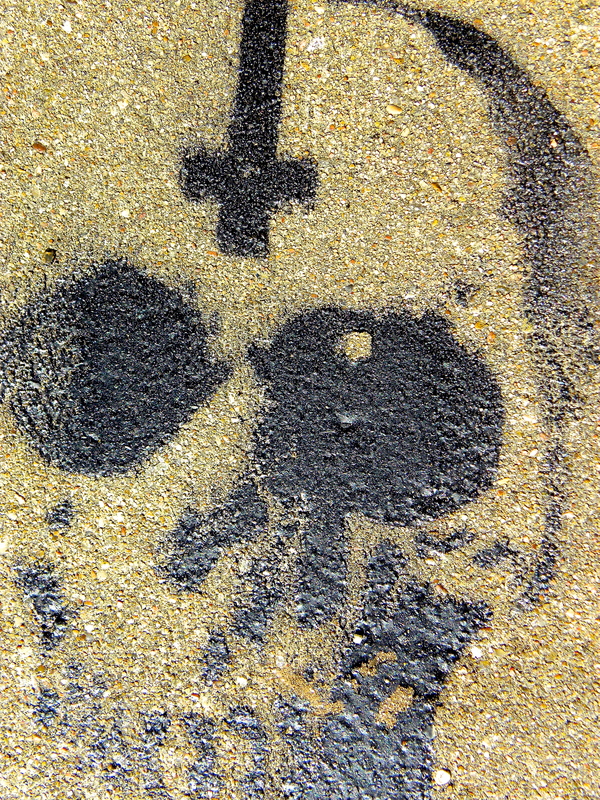 Note: I don’t recommend defacing city streets with Satanic skulls with permanent paint. That’s considered Criminal Mischief, a CRIME. This would be better in a water-soluble, eco-friendly paint instead of spray paint.